Did you know that expecting moms need 1000 milligrams of calcium a day during pregnancy? Calcium helps your baby build strong bones and it helps keep yours strong, too! If you've been choking down calcium pills or chews that are chalky, sticky, or simply too big to swallow, then you are in for a real treat! Adora is made from all-natural chocolate. Adora calcium supplements are smooth, rich and creamy with the perfect amount of sweetness with no bitter aftertaste. 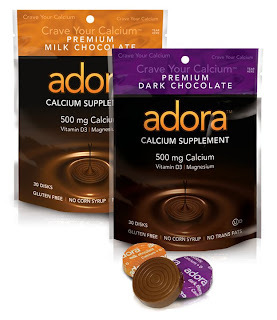 Adora Calcium Supplements are perfect for any chocolate lover, as they come in both milk and dark chocolate. Adora calcium supplements are perfect for anyone needing to get their daily requirement of calcium. They taste great and are also a healthy way to "treat" yourself! This giveaway will end July 30th at Midnight EST. Disclaimer: I received a complimentary calcium supplements from Adora for the purpose of writing a review and hosting a giveaway. Regardless, I only recommend products or services I use personally and/or believe will be a good fit for my readers. The views and opinions expressed on this blog are purely my own. Results may vary. No monetary compensation was received. I learned that they are low in caffeine. contains vitamin D3. D3 is considered to be the more “active” form of the vitamin. They are trans fat and gluten free. I love Adora Calcium chews!!! I have enjoyed them for several years and it is my treat for myself. Not only am I enjoying wonderful dark chocolate (my favorite) but I'm also adding needed calcium to my body. As a women over 60, my bone density is excellent and I give a lot of credit to Adora Calcium! They are only 30 calories! Incorporating calcium and vitamin D (which helps the body absorb calcium) into your diet throughout your life is one of the best ways to prevent osteoporosis. Certified Kosher and contains Vitamin D3 too! Yeah! Each one is diet friendly with only 30 calories and has calcium and vitamin D3 and K! Kosher, transfat-free, no additives or preservatives inside and contain Vitamin D3 too! Calcium indeed helps during pregnancy but I also suggest you take artificial sweeteners during pregnancy. It's safe for you pregnant ladies and it's healthy too.